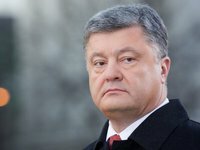 Ukrainian President Petro Poroshenko has said that Ukraine now has a high-precision missile with a radius of destruction of more than 1 kilometer. "Today we have a rocket, which has successfully passed tests, is capable of hitting a target more than 1 kilometer away. It can carry a warhead weighing 150 kilograms. In Soviet times, it was 80 kilograms. It is a high-precision missile created by Ukrainian specialists and the Ukrainian Armed Forces, who are now learning to use it," Poroshenko said during the Freedom of Speech program aired on the ICTV channel on Monday. Poroshenko also said Ukraine has another anti-ship cruise missile system, the "Neptun" ("Neptune") capable of hitting targets within a radius of 300 kilometers. As reported, Ukrainian Defense Ministry advisor Yuriy Biriukov on April 9 said on Facebook that Ukraine is currently testing another missile system, the "Grim-2," which will be capable of hitting targets within a 300 kilometer radius. The land-to-air missile system has a range of up to 300 kilometers.